Style Salute Mondays: Shea of Curves and Confidence!! 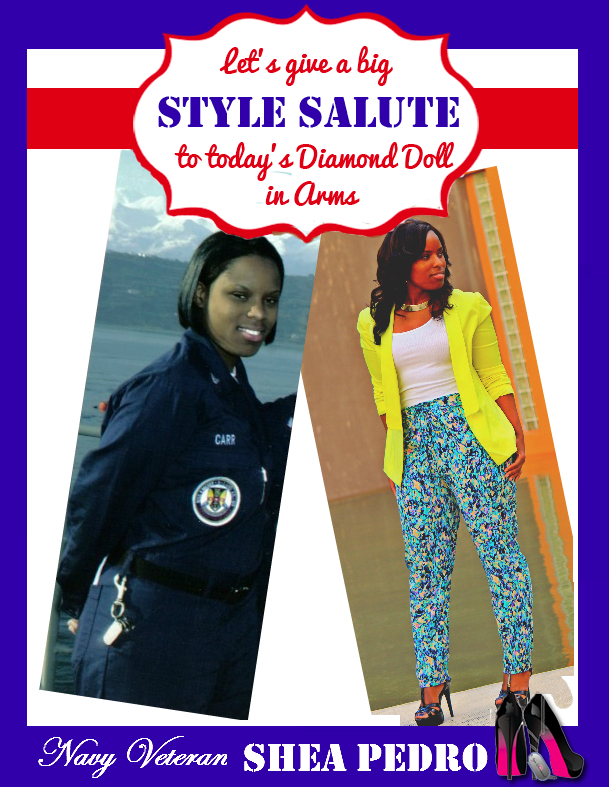 So we are on Week 2 of our new Style Salute series featuring women associated with the military with exceptional style. Thank you all for the positive feedback and response to this feature, I thank you all. Also, thank you ladies who have submitted your pics, thank you so much and you will be featured in the order your pics are received. These ladies serve MAJOR style on and off duty and Ms. Shea is no exception. Some of you blogger babes may recognize Shea from her blog Curves and Confidence, if you haven't checked it out please do....trust you will be addicted! I know I was. Shea is a Navy veteran who has had the pleasure of serving time in Europe and the Middle East. She was stationed in Italy her entire time and can you say JELLY! I bet that was an awesome assignment and I know you came back with a mean shoe game girl! You betta WORK Ms. Shea, I.SALUTE.YOU! You can also check her out on any of her social media hangouts here loves! If you are a woman associated with the military or know someone who is please submit your photos to Najadiamond@gmail.com! I want to Salute YOU for your sevice and your STYLE! Thank you so much for creating this feature and including me, I sure have come a LONG way since then, lol. This is such a great feature! That's my virtual bff up there! Go Shea! Yes! I love Shea! I follow her blog and I love her style.